Welcome back for Day 3, the final day, of the Fresh Squeezed Stamps October Release! All of the stamps showcased the past three days will be available for sale tomorrow at the Fresh Squeezed Stamp Shop. Holiday Tag Alongs is great set to use to whip up some cute and original tags for your holiday packages! Head on over to the Fresh Squeezed Stamps blog to see what the rest of the Design Team has for you today! oh i love those tags! Love these sweet tags! So festive and fun! what a pretty set of tags Tracey! love the Christmas colored twine! these are so fun Tracey! Love the tags! Such a pretty set of tags, Tracey! Perfect for all of your holiday gifts! Oh these are just darling! What cute stamps! Love them! These tags are fabulous...I love all the images and they may just get me to use tags on my gifts this year...so fun. so behind, I missed so many releases this week and so many other things. Very cute tags. Looks like they could be whipped up in a jiffy, too. 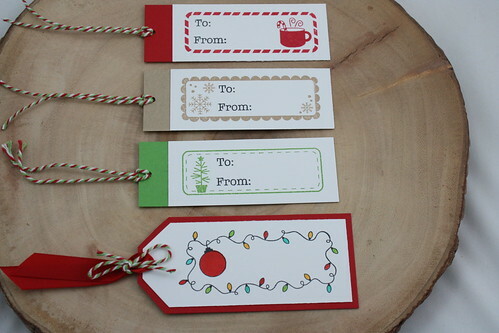 oh cute are these tags... totally love them..
Beautiful set of Christams tags!